The week started at SPX 2174. After making an all time high on Monday at SPX 2178 the market pulled back to 2148 on Tuesday. After that the market worked its way higher to make another new all time high on Friday. For the week the SPX/DOW gained 0.50%, and the NDX/NAZ gained 1.2%. Economic reports for the week were mixed. On the downtick: ISM manufacturing/services, construction spending, factory orders, consumer debt, plus weekly jobless claims and the trade deficit rose. On the uptick: personal income/spending, PCE prices, the ADP, monthly Payrolls, and Q3 GDP estimates. Next week’s reports will be highlighted by Retail sales, Business inventories and Export/Import prices. Best to your weekend and week! Before getting into all the details of this weekend’s report, which presents many variables, it is important to note that the minimum this long term uptrend can rise will not be made until the NYSE makes new all times highs. Which is still about 4% away! When reviewing the weekly chart of the NYSE we continue to count this advance as Primary V of a five primary wave bull market. This is the most popular count in the Elliott Wave blogosphere. From the February 2016 Primary IV low this index has advanced with a Major wave 1 uptrend, an irregular Major 2 downtrend, and now a Major 3 uptrend underway. We’ll make some observations of this Major 3 uptrend in the next section. 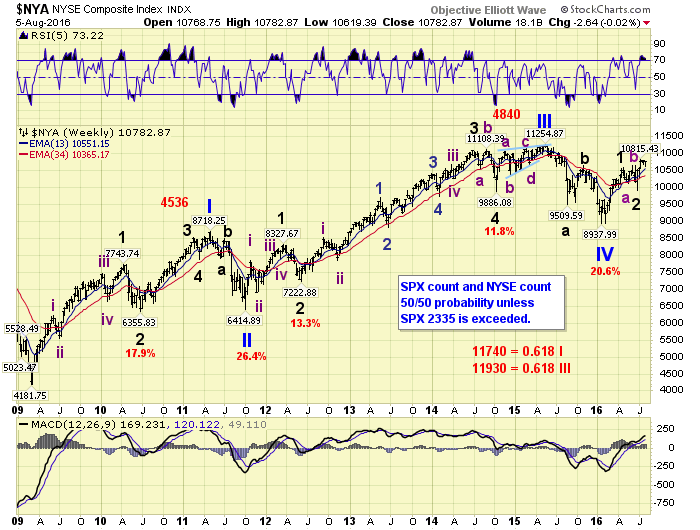 Due to the objectivity of OEW the count presented on the SPX chart is quite different. This count suggests the bull market ended in 2015 with five primary waves up, then entered a primary ABC bear market. 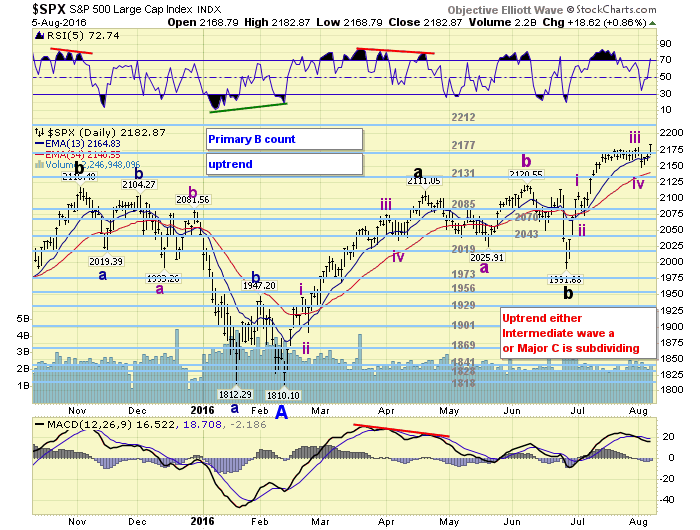 Under this scenario the February 2016 low was not Primary IV, but Primary A. And the current advance, even though the SPX is making new highs, is an irregular Primary B with a maximum upside of 2335 (1.618 x Primary A). Should the SPX exceed this level then the count being presented on the DOW charts, which will not be covered in this update, will be the main OEW count. 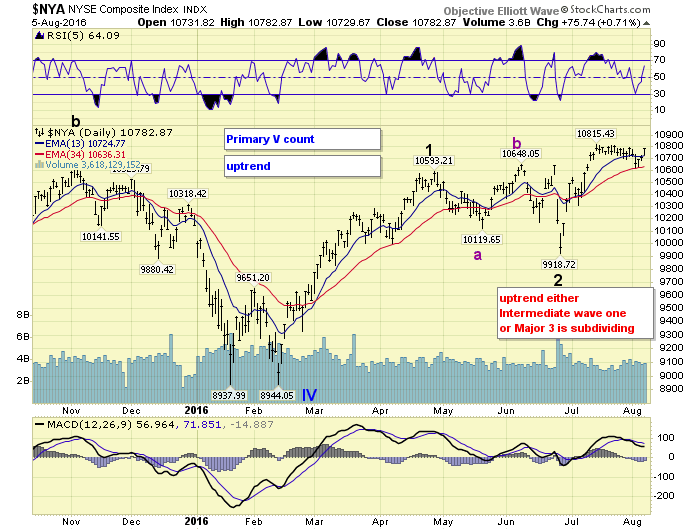 Keep in mind both counts suggest at least another 4% upside in the major indices. We continue give both the NYSE and SPX counts an equal probability of 50%. When reviewing the NYSE daily chart we observed something quite interesting. The Major 1 uptrend off the Primary IV low was quite strong as the NYSE advanced 1650 points to 10593. Then after an irregular correction to NYSE 9919 the index started what was expected to be a Major 3 uptrend. However, as noted in the next section, this uptrend may be ending soon and this advance does not look like a Major wave 3. It has only advanced about 900 points thus far, compared to the 1650 point advance of Major 1, and looks more like a subdivision of Major 3: i.e., an Intermediate wave one. Also, any correction from even NYSE 11100 would overlap Major wave 1 at NYSE 10593. This suggests two possibilities. One: this uptrend is only Intermediate wave one of Major 3, or. Two: this uptrend is subdividing and is going to continue higher than anticipated. Either way is a net positive for the market. The SPX count, as noted on the above chart, displays four Intermediate waves completed from the Major wave B low at SPX 1992, and Int. wave v underway. 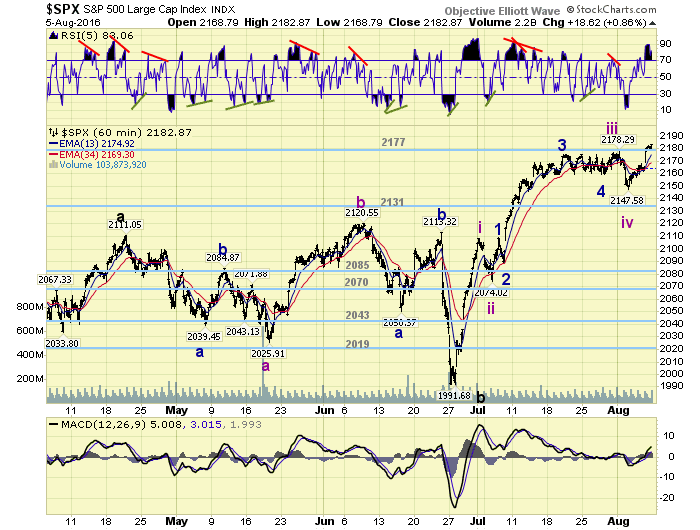 This is the count we have been tracking throughout this expected Major wave C uptrend. If this uptrend is to end soon, as noted in the next section, it can not be all of Major wave C. Major C can not end until the NYSE has at least made all time new highs! Therefore the two variables noted above also apply to the SPX but with a slightly different variation. Either Major C is going to subdivide and this uptrend will extend, or this uptrend is only Int. 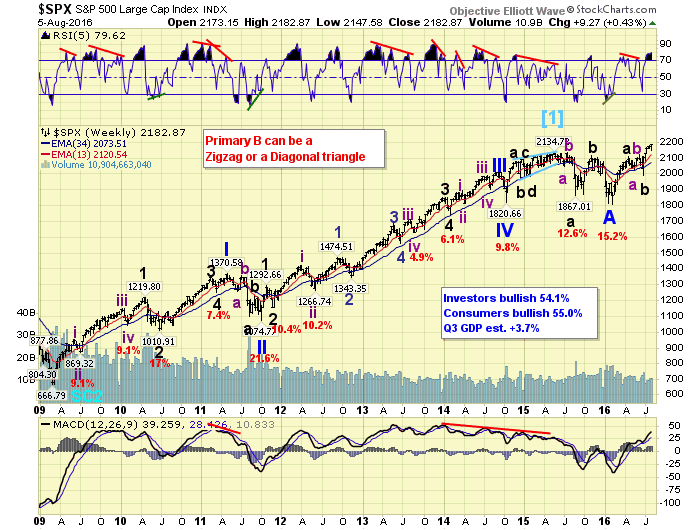 wave a of Major C. The market has reached an interesting, albeit positive, inflection point. Medium term support is now at the 2177 and 2131 pivots, with resistance at the 2212 and 2252 pivots. This section will hopefully explain what was implied in the two previous sections. The uptrend that started at the SPX 1992 low in late June, has thus far progressed in four Int. waves with the fifth wave underway. The problem arises in that Int. wave iii (104 pts.) was shorter than Int. wave one (117 pts.). As you know third waves cannot be the shortest wave. So Int. wave v has to be equal to or less than Int. iii (maximum 2252), or the entire uptrend is actually subdividing into a much larger uptrend. In which case Int. waves one and two would remain the same, but Int. wave three and four would actually be Minor waves 1 and 2 of Int. iii. An interesting juncture. Under the current count, uptrend ending soon, there are several Fibonacci and Pivot levels that are worth noting. The pivots at 2212 and 2252, ( 7 pts.) are clearly the most obvious. The next obvious is the 2200 level, then the Fibonacci levels at 2221 and 2230 all at 2 pts. Anything above SPX 2252 and this uptrend is subdividing. Any correction after an uptrend completion, within these levels, and Major wave 3/C is subdividing in trends. Any SPX print above 2335 and it is probably heading much, much higher. Short term support is at the 2177 and 2131 pivots, with resistance at the 2212 and 2252 pivots. Short term momentum ended the week extremely overbought. Asian markets for the week were mixed for a 0.2% net gain. European markets were also mixed for a 0.3% net loss. The Commodity equity group were all higher gaining 0.7%. The DJ World index lost 0.2%. Bonds appear to be downtrending and lost 0.8% on the week. Crude may have bottomed and gained 0.5% on the week. Gold is still in an uptrend but lost 1.0%. The USD may be starting an uptrend and gained 0.7%. Tuesday: wholesale inventories. Wednesday: budget deficit. Thursday: weekly jobless claims and export/import prices. Friday: the PPI, retail sales, consumer sentiment and business inventories. Copyright © 2016 Tony Caldaro - All Rights Reserved Disclaimer: The above is a matter of opinion provided for general information purposes only and is not intended as investment advice. Information and analysis above are derived from sources and utilising methods believed to be reliable, but we cannot accept responsibility for any losses you may incur as a result of this analysis. Individuals should consult with their personal financial advisors.